This Oct. 25, 2017, file photo shows diners eat at a Chipotle restaurant in Chicago. 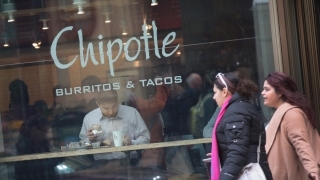 Chipotle Mexican Grill is launching a new campaign to win back customers by remaking the troubled burrito chain into a lifestyle brand, CNBC reported. New CEO Brian Niccol told investors Wednesday that he'd be closing up to 65 underperforming locations and will add a new menu, which may include a happy hour with $2 tacos and a late-night offering. He also said the company is speeding up mobile and online orders, as well as updating lighting and painting. Niccol is pulling from the same playbook he used when he led Taco Bell, where he added mobile ordering and payment and changed the slogan to "Live Mas."